World Wrestling Entertainment(WWE) stars have always had India as one of its go-to destinations to interact with the large fan-base that the company tracts here. WWE have an increasingly growing market in India and the company have hosted shows in Mumbai and Delhi, joined by Bollywood stars in the past. 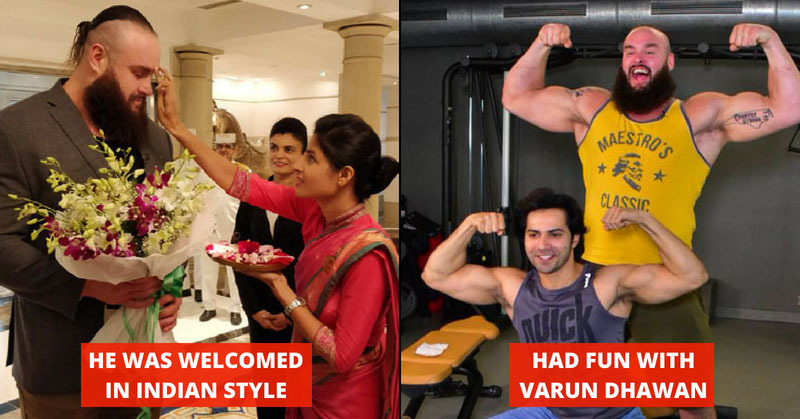 In the latest development, Bollywood star Varun Dhawan, who is also a self-claimed childhood WWE fan met superstar wrestler Braun Strowman. Dhavan idolizes ‘The Rock’ Dwayne Johnson, and he has openly spoken about his admiration for the former multi-time WWE champion who is currently one of the biggest stars in hollywood. Bruan Strowman is one of WWE’s most fierce and dominant wrestlers, he is also the ‘Money in the Bank’ winner which guarantees him a title match at the WWE at any time, which he can avail after cashing-in his case. The wrestler will also meet young athletes from the Special Olympics International, contest winners, and children’s hospital patients. The Monster will also address the WWE’s talent recruitment strategy to find more talent from the country.